Before we get started, we have a really quick survey for all Textillia members, especially those of you who have sewing related businesses. 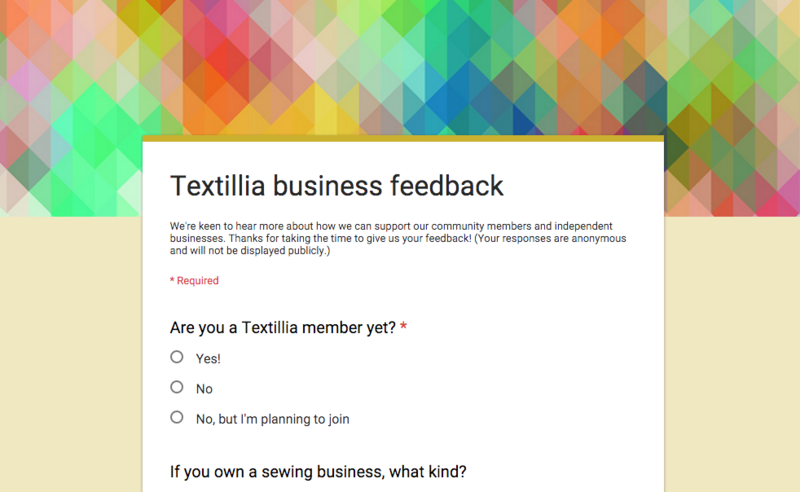 One of our most important goals is to support indie sewing businesses, so we would love to hear your thoughts on how we can support you best, while also making Textillia awesome and sustainable. Click here for the survey! As of a few days ago, there's now a checkbox to signup for the newsletter during registration. If you registered earlier and missed signing up for our newsletter, there's a signup form at the bottom of the site! The newsletter is a great way to stay up to date on new functionality we're adding, and make sure you don't miss out on any important announcements! 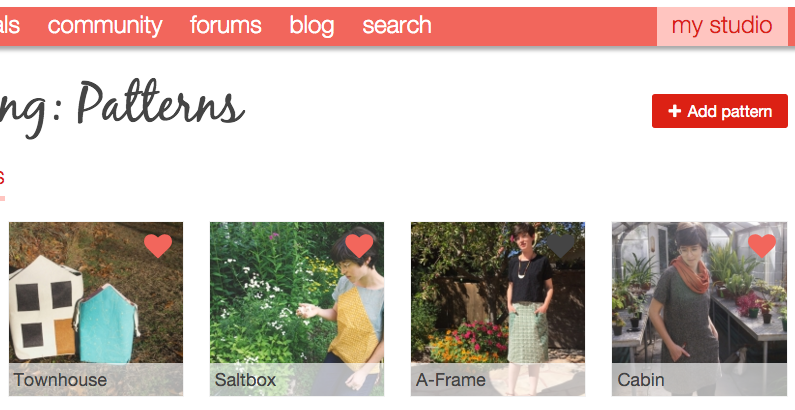 We got some great feedback from members about making it easier to add content from more parts of the site, so we've added a whole bunch of new "Add" buttons for patterns, fabric, and projects. You can add new Fabrics straight from a Designer or Company's Fabrics page, and new Patterns from their Patterns page if you see that something is missing. And you can add your Projects directly from their respective Pattern page, which is handy if you've just searched to see whether the Pattern is already in the database. All the "Add" and action buttons are the red ones in the top right of any page, so it's easy to tell what you can do on a given page. In the image above, you'll also see a new button "Add to stash". 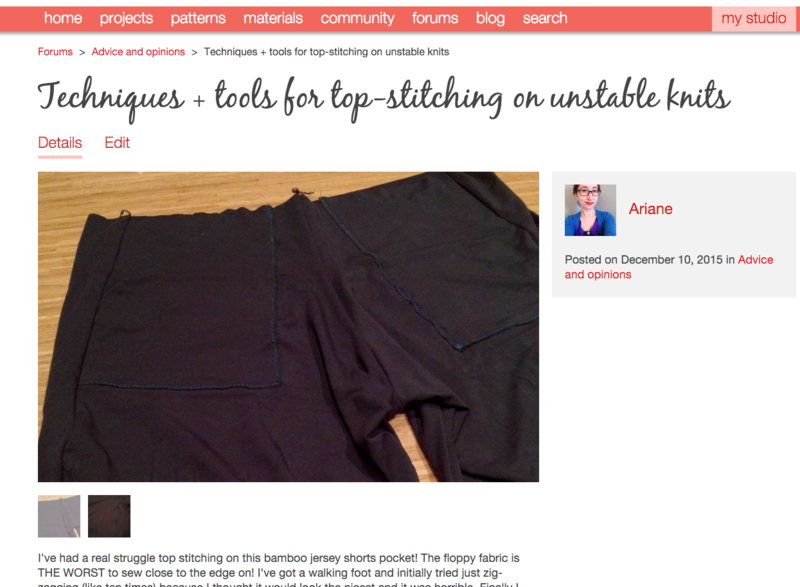 Thanks to numerous requests from Textillia members, now you can stash both fabrics and patterns! 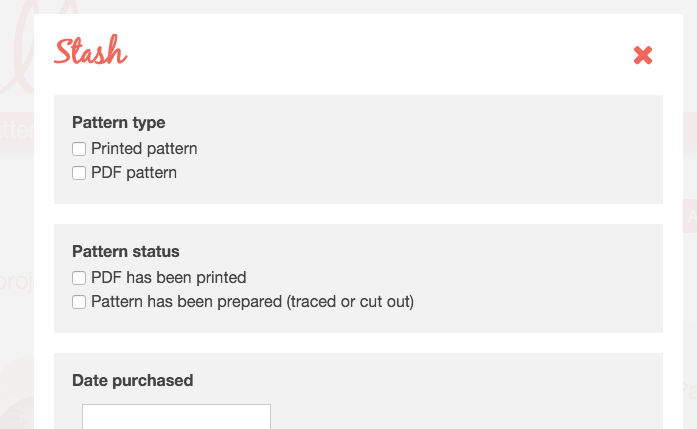 You can track which patterns you own, as well as what type of pattern it is (printed vs. PDF), and whether it's already been prepared for use. Once stashed, you can view all of your stashed items in the Stash section of your Studio (using the menu at the top right). Another popular member request that we weren't planning to implement for a while, but got bumped up the priority list: Forum images! When you start a new forum thread, now you can add images to it, which is great when you need some advice on garment's fit or a technique you're stuck on. We don't have images on the individual comments yet, but it's also on the to-do list. Last, but not least, the server move happened last week - not too exciting news-wise, but you should notice that file uploads are completing a lot more quickly, and we'll have better support as the site grows, so yay!